Private view 17 August 2017. 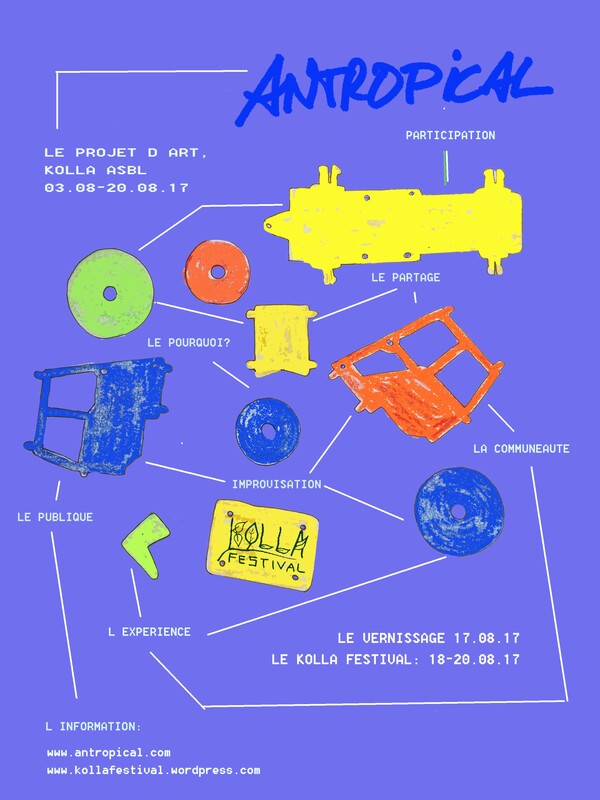 August 17 – 20 at Kolla Festival, Mirador Stengefort, Steinfort, Luxembourg. Already in its second year, Antropical is a project-based art residency, which takes place at Mirador in Steinfort, Luxembourg in August 2017. Up to 15 artists from all over the world will live together on site for 17 days to conceptualise their individual projects based on one revolving theme: “Participation in Art Practices”. Antropical artists will exhibit their work ranging from art installations to music, theatre, dance and much more at the opening on 17th August 2017! The project presentations will remain throughout the ensuing Kolla Festival (18 – 20 August 2017). Antropical colludes with the Kolla Festival, connecting young creatives to collaborate on artistic responses that challenge inherent geographical and ethnographic issues raised at the festival. This year’s focus is on the audience: How do we deal with the conservatism in art when art becomes part of ordinary life? Web designers, social designers, game designers, product designers, stage designers, film directors, videographers, actors, VR developers, programmers, architects, engineers, fine artists, performers, curators, art historians, art marketeers, carpenters, landscape designers, construction site workers, teachers, and anyone who is interested in the debate. TOBLERONE 2nd edition, Refuge Forestier de Begnins, 2015. FarFlung, The Platform 504, 2015. TOBLERONE, Sentier des Toblerones, 2014. EXPAT, The Artworks Elephant, 2014.